This formula is available for two weeks to the general public. After that time it will be restricted to members only of The Baking Network. 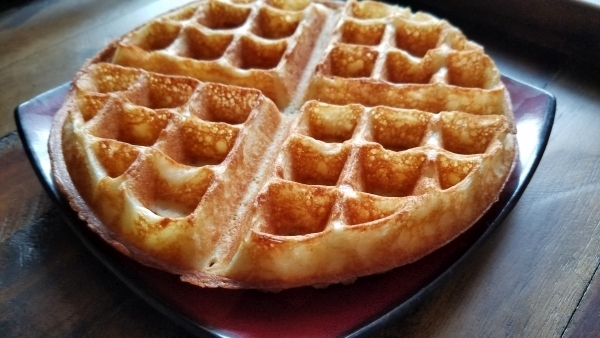 These waffles are so good, light fluffy on the inside and crisp on the outside. A piece of heaven that will get gobbled up quickly! 185 grams of liquid ( I used 100 grams of water and 85 grams of full fat milk). Mix and let set out at room temperature overnight (covered). 6 grams of salt (if using unsalted butter then use 10 grams of salt). 15 grams of water which you add 6 grams of baking soda(Add this mixture to the batter at the end). In a separate large mixing bowl add your melted butter, three eggs and salt. Whip together. Now combine the sourdough starter (bowl 1) into the egg/butter/salt/sugar mixture (bowl 2) and whip to incorporate the starter. Once it is smooth, add the water/soda mixture (bowl 3) and whip it into the batter. 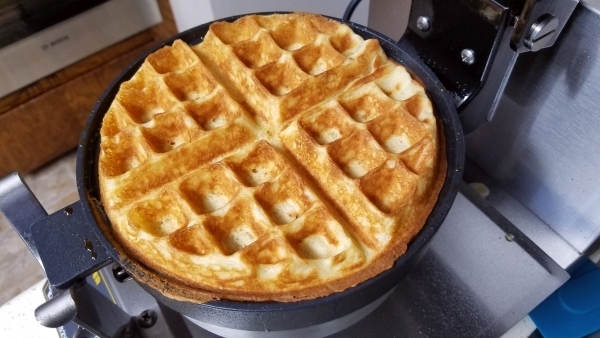 The batter will turn fluffy immediately, so have your waffle iron hot and ready to go when the batter is finished. This formula made five 7.25″ diameter waffles and they disappeared fast!